Earlier in 2014 On Display – Gunboxesusa.com was given a commission to make display gun boxes for a Colt 1911 that was engraved with the former President’s signature. These boxes were offered to sailors that were retiring, or whose tours were ending, upon their return to homeport at Naval Station Norfolk after completing a 9-month deployment to the U.S. 5th and 6th Fleet areas of responsibility. The Aircraft carrier docked in Norfolk April 18, 2014. 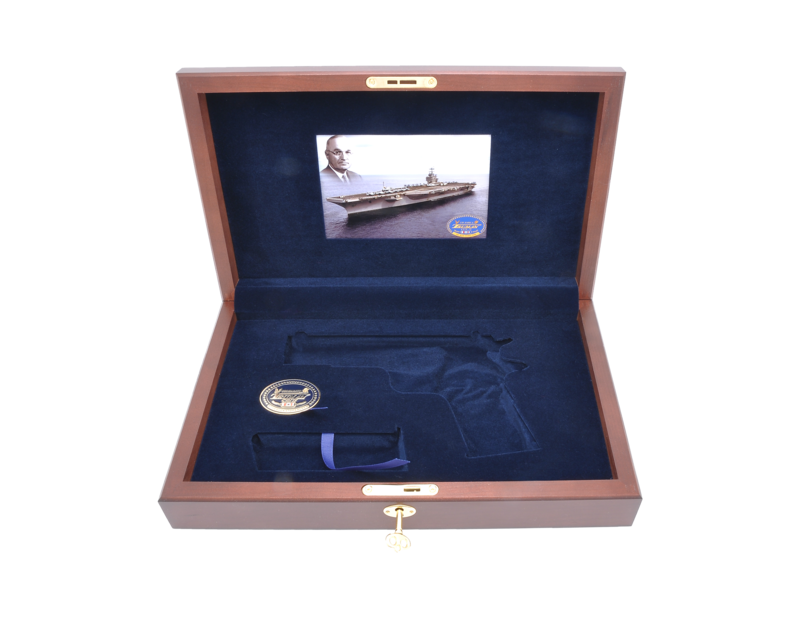 The carrier’s commander selected our boxes to present the engraved pistols because “They are awesome”. A photograph of the ship and a silhouetted photo of Harry Truman was inlayed into the lid of the box and the ship’s challenge coin was inlayed in the bottom portion of the box (see Photo). Additionally, the ship’s logo was laser engraved into the exterior lid of the box, and gold filled.